It sort of started by accident. Beth Colt had just moved to Cape Cod and taken over the Woods Hole Inn in 2011. She was making frequent trips to a local swap shop to leave some of her gently used objects when she spotted a wooden, fire-engine red chair, that someone had left there as well. "My porch didn't have a chair on it and that day, this particular chair kept grabbing my eye. I took it, put it on the porch for a few months and when the pond froze I took it out to help my kids lace up their skates. Honestly, I forgot about it," said Beth. "Then one day I snapped a photo of it down by the pond, it was kind of cool, it looked like the chair was floating on the ice, and I shared it on Facebook and it went viral." Shortly after, a woman in Santa Barbara contacted her and said she wanted to come, stay at the inn, and see the chair. "It was March and it was freezing," said Beth, who was surprised the chair had brought her a guest from sunny California in the middle of winter. She was even more surprised to later learn the woman, Julie Ann Cromer, was a photographer and wanted to borrow the chair for a photo shoot. "She said the chair had opened up a whole new place in her work." A few months later, Beth received a framed canvas print of the chair sitting on a local beach on a stormy Cape Cod day. "It's really dramatic and the chair pops off it. I was moved to tears," recalled Beth. "It was so beautiful and it had opened an artistic dialogue with one of my guests. That was my first inkling that there's something kind of special about the chair." Newly inspired, Beth wrote a blog about the chair that seemed to resonate with others since she saw a spike in web traffic. She mentioned all this to Jay Karen, then-CEO of PAII, who connected her with Marti Mayne, of Maynely Marketing, who'd been working on the A Better Way To Stay campaign. Marti suggested the chair make its way to different bed and breakfasts in the area and later the region. But like any new endeavor, it was hard to know what would come of things. "I thought there was potential. I did not actually expect that it would have the impact that it had," said Marti. "But I did begin to see it could become an icon for the bed and breakfast industry and had a lot of merit in terms of brining attention to the B&Bs." The first press story came from The Falmouth Enterprise, then the Cape Cod Times, which had a broader audience and pushed the story out across New England. As a result, New England Cable News saw it and did a 5-minute story when the chair crossed through Mystic, Connecticut. "The innkeepers in Mystic were really great marketers and that’s when it really took off in TV in this region," explained Beth. 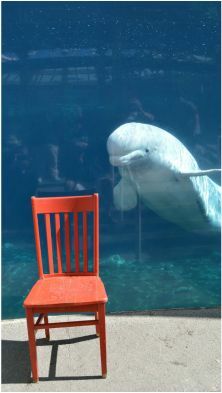 The Inn at Harbor Hill Marina partnered with the Mystic Aquarium so the chair could visit with a Beluga Whale. While it was a great photo opportunity for 'Red' (as the chair is affectionately called), the aquarium then used the 'meeting' to share content through their social media channels too. In fact, nearly a year later, Red would visit the Pennsylvania State Senate, courtesy of Senator Brubaker, under the watch of the Carlisle House B&B and the Pheasant Field B&B. Eventually Red needed a travel agent; that's when Beth hired Kaylee Costa, to pull double duty as a travel coordinator and the front desk agent at the Woods Hole Inn. Nowadays, Red gets about a week with each participating innkeeper; it used to only get a few days. "I was gathering information from innkeepers and doing things behind-the scenes," said Kaylee. "I would do research, trying to find an innkeeper in middle of a long stretch between two inns to break up that large gap, reaching out, cold calling, and updating the website along the way." One of the innkeepers Kaylee came across was Janice Hurley Hollis, who in 2012, ran The Inn At The Round Barn Farm in Waitsfield, Vermont. "I got to host the chair and deliver it to another innkeeper at a midway point. It gave me an opportunity to get outside of the inn and to go meet an innkeeper that I may not have otherwise met," said Janice. "It was a really neat way to tell the story of your area and your inn. Every inn has a story." A couple of years later, Janice left innkeeping and now works with BedandBreakfast.com, where she's the in-market strategic sales executive. These days the online bed and breakfast directory sponsors the Red Chair Travels initiative and runs the bulk of the coordination efforts, sending the chair to different BedandBreakfast.com inns, as well as B&Bs belonging to state associations. "Every stop that Red makes is a brand new story, and not only is it an outlet to share the story of the inn, it's a way to share the story of the area." A sentiment shared by Kaylee: "It allows you to play in your own backyard, which a lot of people take for granted. I know I did growing up in the Cape and I still do. To this day haven't done everything I should in the area but having the Red Chair I was running around Woods Hole checking out something I wouldn't have otherwise." "This was much more than a chair," explained Janice. "For whatever reason, it was acting like the Flat Stanley of the B&B industry." It was also a tremendous vehicle for press. Now in its fourth year making the rounds, the stories keep multiplying. "When the inn accepts to be part of the journey they agree to write a blog post, agree to share photos of Red at different spots it visited in the area, and then share it with Red Chair Travel and put it on their blog, and their social media, then BedandBreakfast.com shares the content though all our social media channels," said Janice, who confirmed that there is no cost to participate though there is a an application process. While inns are responsible to alert media in their hometowns, a press release template is available to easily fill in for innkeepers to share via email. Red has traveled the United States -- usually by car, always innkeeper-to-innkeeper. Presently the esteemed chair ismaking its way through Canada, traveling through British Columbia. Come Spring, it heads to Alaska. From there Red will need to be shipped to its next location, though BedandBreakfast.com is still deciding where it will go. Would you like to be part of the journey? Visit http://www.bedandbreakfast.com/info/innkeepers/your-membership/red-chair-travels if you'd like to get involved. Want to Attract Millennials? Here’s How.